These are various photographs which either don't have a place elsewhere on the site, or don't yet have a production process outlined for them on the site. 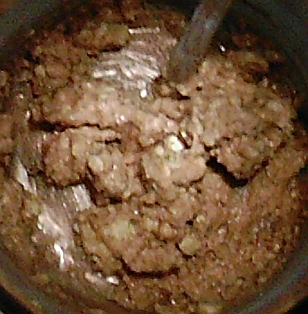 This is gold hydroxide mud which is simply gold hydroxide precipitated and then most of the water evaporated. Has the consistency of pudding. 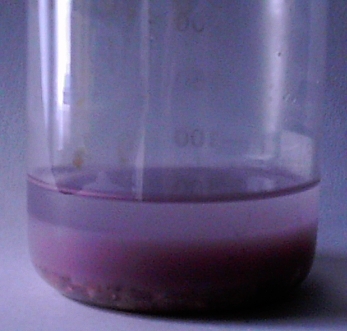 This is red gold chloride made by swinging the pH of the solution up and down from acid to alkaline. It's what some people believe is the Red Lion, but they are mistaken. This is just gold chloride that has been broken down into small cluster sizes, so it appears red instead of golden. Every color of the rainbow can be made in this way. Tin was dissolved in Nitric acid, and it precipitated as Tin oxide (stannous oxide) because Nitric acid oxidizes the tin while it dissolves it. 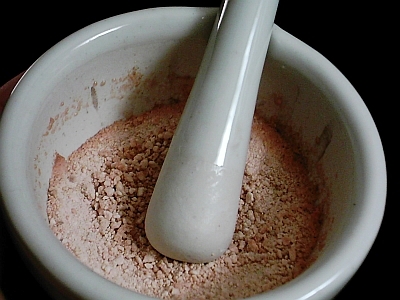 Since the tin is insoluble, it precipitates as a white powder. 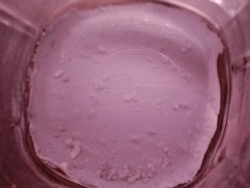 After washing, the tin acetate was placed in concentrated red wine vinegar, and that is why you see it stained purple in this photo. Tin acetate gradually forms when the acetic acid attacks the tin oxide. In alchemy the acetate of tin is known as Acetum of Jupiter. Here we see the tin acetate after it's been washed. It's quite a nasty mess which sticks to the glass beaker and is hard to work with. 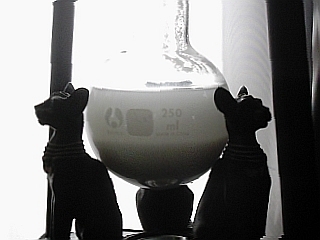 Tin oxide resting in a candle holder made of Egyptian cats. 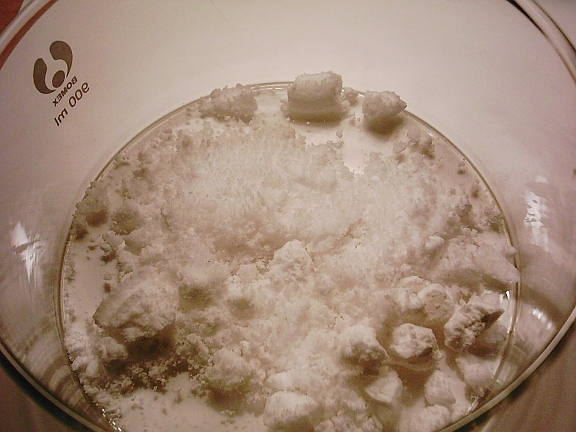 Sodium nitrate (saltpeter) which was made by simply mixing a lye solution with nitric acid and evaporating. This photo was taken when it was in the evaporating dish. Crushes like snow and makes the same sound. Never make this chemical without reading up about the dangers. It can also be made using ammonium nitrate and soidum chloride instead of wasting expensive nitric acid. 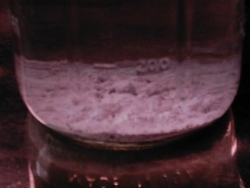 Silver chloride was precipitated out of a silver nitrate solution by adding salt water. The silver chloride is insoluble and precipitates to the bottom as a fluffy powder. In this photo it's still falling to the bottom and you can see the purple tint. Here it is completely settled on the bottom. This is after it was washed to remove the acidity of the nitric acid. It now has a mud and pudding like texture. Once dried it becomes extremely hard and bonds to the glass. It becomes more and more purple as it sits exposed to the light. 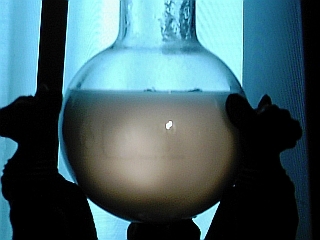 Calcium nitrate made by dissolving agricultural lime in nitric acid then evaporating. Everything made with calcium seems to be like a rock instead of crystals, which makes it a little hard to work with. Plaster of Paris is calcium sulfate. Calcium carbonate is limestone. 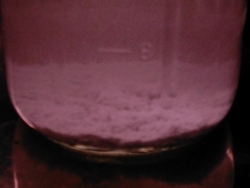 This photo shows the calcium nitrate after it was ground into a powder. After being exposed to sunlight or focused moonlight, it glows red when heated to a high enough temperature (around 500°C). It's charged with moonlight focused through a magnifying glass, then allowed to absorb Morning Dew which is called deliquescence. It's then placed in a flask and the water is distilled and collected. This water is known in alchemy as the "Living Water" and the Spiritus Anima (animated spirit). 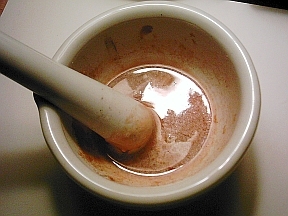 After several days, the powder has become liquid just by sitting exposed to the air. And this is during the winter with humidity lower than 30%. If it sits outside in the morning dew before sunrise, it will collect enough water in just one night. It's now ready to be distilled. The beauty of this material is that once exposed to intense light, it moves the atoms into a higher spin state until the material is heated to 500C and it finnally can release this extra energy in the form of light particles. But until then, it's charged with a good deal of energy. This helps the water gain it's charge, and the energy isn't released until the end of the distillation when the material is completey dry again and starts to glow. The water collected in this manner should never be touched by the bare hard or metal objects because it will then loose it's charge. With enough of this water in a glass flask, a finger held next to the glass will make a continuous spark jump like static electricity through the glass to your finger. It's a little tricky to see even in total darkness and can't be felt. One website selling alchemy tinctures even has a photograph of this effect. 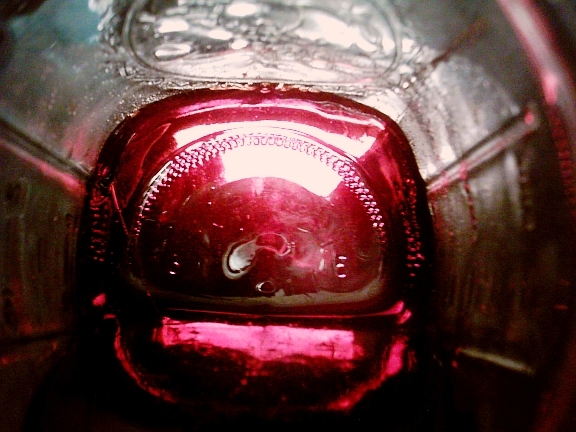 A can of concentrated grape juice was poured into a glass jar. The can was refilled with water and a tablespoon of sodium hydroxide was dissolved therein. This warm lye water was then added to the grape juice concentrate. This raised the pH and caused the sugars to break down and release the monatomic elements. The water was then evaporated and a syrup formed, which is pictured above. Here the syrup is red instead of the purple like grape juice would normally be. It's actually completely red, but the camera made the photo have a hint of purple. 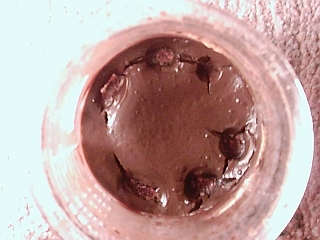 This syrup is dried to a hard black crust (which is actually dark red) using the heat of a candle flame, which is then crushed into a powder using a mortar and pestle. When a magnet is run over the powder, it will pick up the magnetic superconductive monatomic irdium and rhodium. 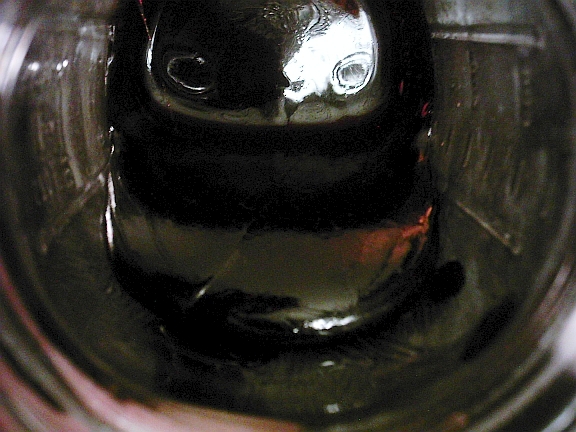 The can says it contains 0% iron, so this is a non-ferrous magnetic material in the grape juice, but ONLY after this process is performed on it. The magnetic material is indeed monatomic iridium and rhodium. It's only magnetic because the atoms are too close. Once they are separated using a matrix of plastic or even ceramic clay, you can create a levitating disk. This material is so sensitive, it levitates even when touched because of the moving magnetic field around the human body. That process will be detailed on the Technology section of this website which has yet to come.